On Monday, August 14, 7:30 p.m. Central Time, which was Tuesday, August 15, 8:30 a.m. in Taiwan, the Village of Westmont and Hsinchu County, Taiwan took part in a Sister City Signing Ceremony, which was conducted live via Skype. 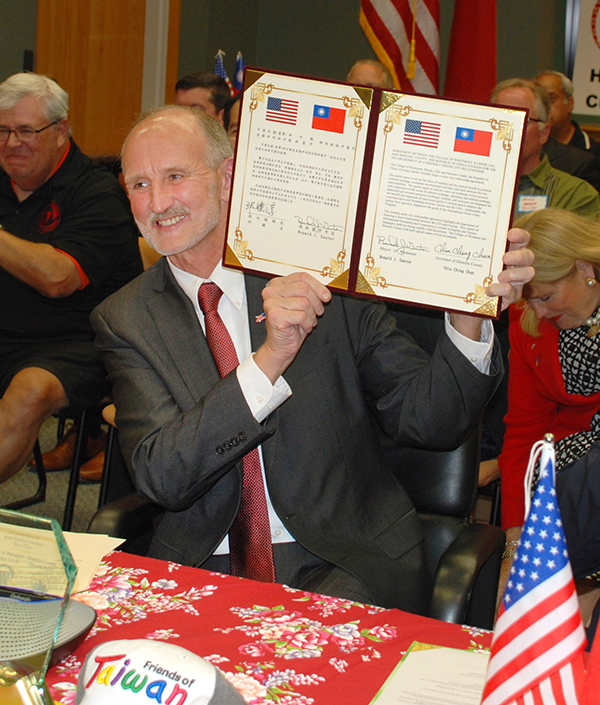 Westmont Mayor Ron Gunter and Hsinchu Magistrate Ching Chun Chiu signed the official Sister City agreements during the ceremony pledging to work together and foster a relationship that supports cultural exchange, educational exchange, municipal exchange, and economic development. The signing ceremony occurred on the anniversary of the date in which the two leaders met in person for the first time when Mayor Gunter was touring Taiwan as a guest of TECO (Taipei Economic and Cultural Office). The ceremony also included the signing of an official student exchange program agreement between Community Unit School District 201 in Westmont and Liou Jia High School in Hsinchu. The ceremony included a number of guest speakers including State Representative Patti Bellock and Hsinchu-Westmont Sister City Diplomat Angela Yang. TECO Director Robert Chang read a written congratulations from TECO Director General Calvin Ho and then presented a special gift to Mayor Gunter. Also, ABC-TV Ch. 7’s Judy Hsu sent a pre-recorded video welcome and congratulations to Hsinchu County and the Village of Westmont. After the signing ceremony, there was a gift exchange between the two sister cities, during which the new Hsinchu-Westmont Sister City logo was unveiled. Both Magistrate Chiu and Mayor Gunter also presented art as gifts to each other to commemorate the moment. “This is just the beginning,” said Hsinchu-Westmont Sister City Diplomat Yang. “We plan to be very active with this Sister City program and we hope that everyone gets involved to enjoy the benefits of this wonderful union. Our next project is the student exchange program, which will begin this November when Taiwanese students visit Westmont over the Thanksgiving holiday. For more information regarding the Sister City program, contact Sister City Committee Co-Chair Larry McIntyre at communications@westmont.il.gov or 630-417-0280. To see photos from the event, please click on the link below.